With the Cthulhu-tinged Whispers Of The Old Gods, Blizzard Entertainment delivered a huge influx of new cards for Hearthstone, its mega-popular Warcraft card game, earlier this year. While it wasn’t all that competition-friendly, I loved how Whispers drew on the zanier aspects of the game and blew them out of the water with super-powerful elder gods and lots of unpredictable cards. I’ll be spending this weekend wrapping up Hearthstone’s latest addition, a suite of single-player challenges called One Night In Karazhan. It taps into that same goofiness that made Whispers so wild but applies it at a broader aesthetic level. Where past single-player expansions have taken card-slingers on campaigns through cursed tombs and Indiana Jones-style adventures, in Karazhan, you’re just trying to help save a kickass party. The roguish wizard Medivh (looking much younger than Warcraft fans are used to seeing him) has invited the player to an epic rager at the tower of Karazhan, but because this is a video game, things turn to crap before you even arrive. Pissed off that he wasn’t invited, the evil Prince Malchezaar crashes the event. Medivh fends him off but is sucked into a portal and transported to some demonic realm. When the player’s unseen character arrives, the tower’s steward asks you to climb Karazhan and save your gracious host. 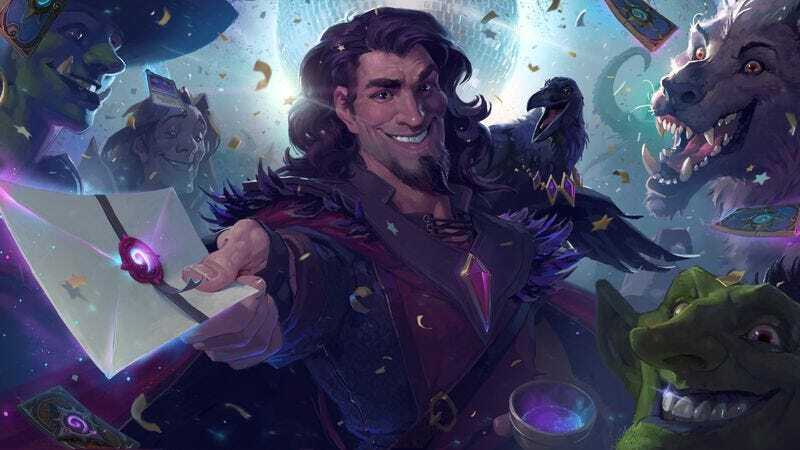 Unfortunately, all the festivities and parlor tricks Medivh set in place to entertain his guests are running amok, and you’ll have to card battle your way through them to get this party back on track. The various scenarios and sights you’ll encounter are cleverly imagined and play off various cultural references to build up not only the expansion’s cast but also its unique challenges. Your first fight is with a sentient beast made up of enchanted silverware whose special ability, which summons anthropomorphic plates, is called “Be our guest.” Later, you’ll enter the tower’s opera house and do battle with an ersatz Juliet who has the power to summon her Romeo at will and is invulnerable while he’s on the board. Another fight tries to imbue Hearthstone with some chesslike properties, as your entire deck is made up of various chess pieces that automatically attack whatever’s across from them at the end of your turn. If the piece is lined up between two enemies, it’ll attack both, making careful positioning of your minions more important than ever. Besides being entertaining allusions, these imaginative scenes all put refreshing new spins on the way Hearthstone is played. Karazhan is crafted with so much verve that it’s hard not to love it. This is Blizzard really running with the silliness that it’s peppered Warcraft with for so long. The writing that comes along with each encounter is often worth a chuckle, and the delightful disco-infused remixes of Hearthstone’s ubiquitous medieval-style soundtrack are shockingly catchy. The expansion was released in several parts over the last few weeks, but it’s available to play now in its entirety. For $20 or a boatload of in-game gold, you’ll get the full story, including 12 battles and various other challenges as well as the 45 cards you win along the way.